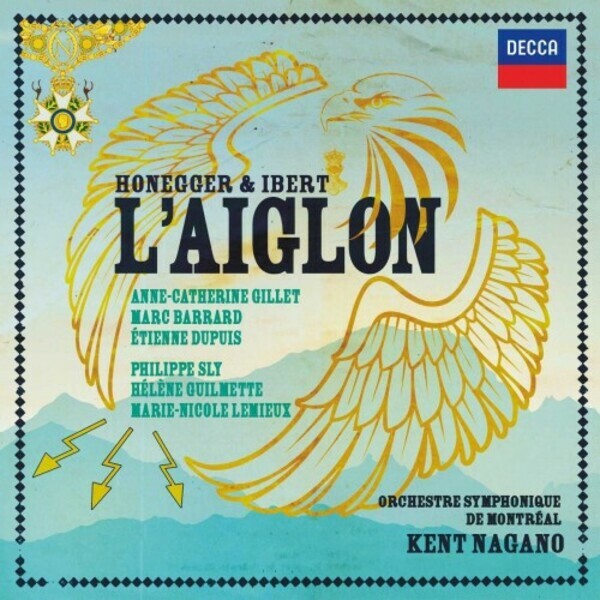 This first recording of the complete, uncut operetta L'Aiglon (the recording was made at the time of the North American premiere in March 2015) is given with an entirely French or French-speaking cast. DECCA and the Montreal Symphony were synonymous for some of the most stunningly engineered and multi-award winning recordings in the 1980s and 90s. This release – the first in a new multi-album contract – revives this historic partnership with the orchestra’s new principal conductor Kent Nagano and in its new home, the Maison symphonique de Montréal. The OSM recordings, under the Decca label, won about 40 national and international prizes, including two Grammys. L'Aiglon is a charming operetta in five acts with music composed by Arthur Honegger and Jacques Ibert. The libretto by Henri Cain was based on Edmond Rostand's 1900 play, L'Aiglon ("The Eaglet"), about the life of Napoleon II. It was first performed at the Opéra de Monte-Carlo on 11 March 1937. Every lover of opera should hear these discs. Until now, the only commercial recording of L’Aiglon - a remarkable operatic collaboration between Arthur Honegger and Jacques Ibert - was an abridged LP version from 1956. Sixty years on, at last we have a complete version, in stunning sound and with a dream cast. And once you’ve heard it, you wonder why on earth it’s taken so long, for this operatic adaptation of Edmond Rostand’s play about the life of the unfortunate Napoleon II (son of Bonaparte, Prince Imperial, King of Rome, Duke of Reichstadt) has it all: romance, intrigue, politics, apparitions, a masked ball, deathbed scene, even a nine-minute ballet. And it’s set to music that is not just charming and beautifully scored, but powerful and moving too. When asked who was responsible for what music in the five-act opera, Honegger and Ibert joked that ‘One of us wrote the sharps, the other wrote the flats,’ but it’s now generally accepted that Ibert composed Acts 1 and 5, Honegger Acts 2 and 4, with both having a hand in Act 3. The story is a straightforward one. In 1831, following the exile and subsequent death of Napoleon Bonaparte, his son the young Duke of Reichstadt (the ‘Eaglet’ of the opera's title) lives in exile at Schönbrunn with his Austrian mother (the former Empress Marie-Louise and daughter of the Austrian emperor). A close eye is kept on the young Duke (who as an infant was briefly Napoleon II) by the Austrian chancellor Prince Metternich, who is wary of another Bonaparte ever gaining power and does all he can to prick the youngster’s naive, idealistic ambitions (the end of Act 2 is particularly dramatic). The Duke is attracted to his mother’s new reader, Thérèse de Lorget, but he also yearns to follow in his father’s footsteps, and is urged on by the veteran Old Guard member, Flambeau, and other supporters. After assignations and an exchange of disguises at a masked ball, the ‘Eaglet’ meets fellow conspirators on the plain of Wagram, scene of his father’s 1809 victory north of Vienna. There, Flambeau dies, and the Duke, feverishly deluded, imagines that he is actually at the 1809 battle. In the final act, the 21-year-old Duke is mortally ill, but finds consolation in the friendship of Therese, who sings him a selection of traditional French songs, and he dies reaffirming his pride in his country and father. The period setting provides opportunities for set pieces (plenty of waltzes recalling Ravel’s La Valse and Valses nobles et sentimentales), as well as snatches of military motifs as past glories are recalled (disc 1 track 7). The spectre of the past also gives rise to some marvellously atmospheric textures, as in Act 2 when Metternich thinks he sees the ghostly figure of a French grenadier. Best of all, the moments of genuine human interaction - Thérèse’s first meeting with the Duke, and their final scene in Act 5 - are touchingly realised. You’d never guess this is the work of two composers, so stylistically harmonious and dramatically focussed is the score. In Rostand’s play, the title role was designed for Sarah Bernhardt, and in the opera it is a soprano (originally Fanny Heldy) who takes the part of the adolescent Duke, à la Cherubino in Mozart's Figaro or Octavian in Strauss’s Rosenkavalier. Thérèse, too, is a soprano, and the scenes between the two characters are meltingly conceived (e.g. CD1, track 2), in music of which Richard Strauss would have been proud, but with an added Gallic lightness of touch. It’s hard to imagine either role being better realised than they are here by Anne-Catherine Gillet and Hélène Guilmette: each sings with ravishingly focussed tone, immaculate diction, and huge expressive commitment. The male leads are both baritones: the scheming but ultimately humbled Metternich is sung by the brilliant Étienne Dupuis, while Marc Barrard vividly captures the impassioned old soldier Flambeau. Above all, this is a real triumph for conductor Kent Nagano, the Orchestre Symphonique de Montréal and Decca. Opera lovers owe them a huge debt of gratitude in at last committing this work to disc in a splendid state-of-the-art recording (before a commendably well-behaved audience). At just over 90 minutes, L’Aiglon is concisely paced, unashamedly employing traditionally ‘operatic’ elements but with admirable restraint (the closing death scene is pitched at just the right emotional level, which is itself something of a rarity). With the Montréal players as well versed in the Gallic idiom as the French-speaking cast, and Nagano a proven master of resurrecting neglected operas, ‘The Eaglet’ can finally spread its wings and take flight. New Decca opera recordings are a lot less frequent than they were in the company’s golden era, but with the Montréal forces they appear to have hit their stride again, and it’s good to see presentation to match, with a full libretto and translation to accompany the attractively packaged discs. Next time, though, shorter biogs and a longer article, please! With a major work reintroduced to the catalogue in a blistering performance, this deserves to do stunningly well.